Ethos Life Insurance Reviews - Best Term Life Insurance? Ethos is website that functions as a life insurance agent that connects you with term life insurance policies from Assurity, a Nebraska-based life insurance provider. Ethos is a life insurance agency that offers term life insurance through an easy-to-use website that simplifies the application process. Entrepreneurs Peter Colis and Lingke Wang founded the company in 2016 and the site launched halfway through 2017 in every state except New York. Based in the San Francisco area, Ethos is one of a couple of new online life insurance agencies offering policies; Fabric is one company we’ve reviewed who offers similar policies. The company providing the policies you get through Ethos is Assurity, a for, based in Nebraska. A.M. Best, an agency who assesses how financially stable a company is, gave Assurity an A- rating, which means there’s a really good chance they’ll have the cash on hand to pay out your policy should you pass away. In our review of Ethos, we’re going to take a look at the details of the company’s term life insurance, the range of rates and fees you can expect, why term policies may be a better choice than permanent policies, and how it compares to Fabric. We’ll finish up the review talking about the company’s strengths, weaknesses and who we think the site is good for. No matter how you obtain your insurance policy (in-person meeting with an agent, online), it’s important that you read through your policy to understand what’s covered and what’s not covered. Take the time to read through the policy Ethos offers you. Pro tip: Ethos isn’t available for New York residents. When you go to Ethos’ website to check out their policies, you’ll see one type of insurance, known as “term” life insurance. These policies are given for a certain amount of time – 20 years, for example – and usually expire before you die. Ethos offers term policies of 10, 15, 20, 25 and 30 years. 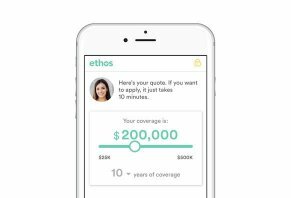 You choose how much coverage you want for your policy up to $1 million and then Ethos provides a premium amount you pay every month. If you die and the death is covered by your policy, then your beneficiary will receive your death benefit. All the premiums you paid, however, are lost. In order to get a term life insurance policy with Ethos, you’ll have to fill out an application in which you’ll have to provide details about your health and medical records. There is a chance that your medical history will disqualify you from policy, but that’s something you won’t know until you submit your application to Ethos. In most cases, though, healthy individuals have a good shot at getting a policy. And, you won’t need to get an examination for any policy under $1 million dollars. Blood tests and examinations are relatively common; the company wants to know you’re in good health before insuring you. High cholesterol or blood pressure could raise your premiums. Ethos says their cheapest term policies begin at $6 a month. We did a test run of their term pricing tool, entering the following information: Male, non-smoker, 40, great health. Ethos also gives you a Name Your Price tool where you can put in how much you want to pay every month and they’ll give you the coverage that price will get you. We put in $10 and were offered a $26,000 policy. You also have the option of adding “riders,” which are basically extra insurance policies. You can get a disability waiver that, in the event that you become disabled, stops your premium payments during your disability and pays your basic expenses. There’s also a critical illness rider that will pay you a lump sum if you’re diagnosed with certain illnesses like cancer, a heart attack or a stroke. 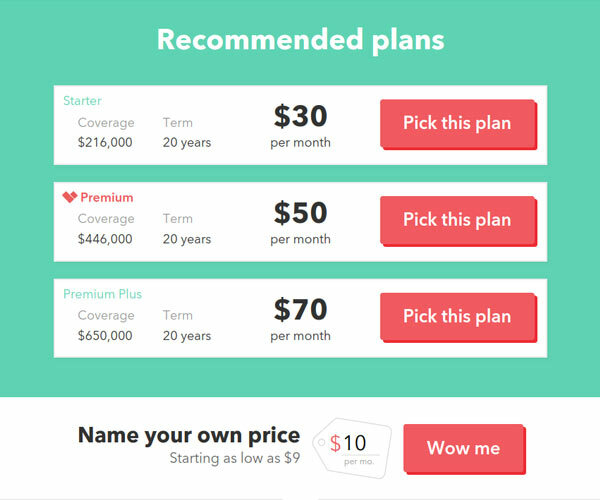 The final rider listed on the Ethos site is the endowment benefit that pays out a certain percentage of your premiums if you end your policy for reasons other than death. Pro tip: Ethos claims their term policies can get you 20% more coverage than AIG, New York Life and Prudential for the same price. We read through the fine print to find out the various limitations and restrictions related to these term policies. First, you will lose your coverage if you pay your premium more than 30 days late. Also, if you commit suicide within two years of starting the policy, the insurance company will pay out what you paid in premiums. Additionally, if you get certain diseases within 90 days of adding your critical illness rider, you’ll only be paid a fraction of the lump sum the policy provides. While term life insurance policies are limited to a certain amount time, permanent life insurance policies are not. They cover you for your entire life. However, the coverage comes at a cost that’s up to 30 times greater than the premiums you’d pay for a term life insurance policy of the same amount. Exactly why that is deals with the nature of the policy – it covers you up until your death, unlike a term policy that will likely expire before you die. This gives you a good explanation of why term and permanent are different. Assurity’s own marketing materials liken permanent plans to “owning” your policy while term insurance is like “renting” your policy. It’s important to point out that permanent life insurance policies give you the ability to recoup some of the premiums you paid, too. While Ethos doesn’t offer permanent life insurance, you can purchase it through Assurity. Ethos is very similar to another company that we’ve referenced a few times: Fabric. The two sites operate in much the same way. Both make it really easy to get term life insurance online and both claim to offer policies for as low as $6 a month. Some of the differences are that Fabric’s site offers accidental death policies and term policies, whereas Ethos offers only term insurance. Another thing that differentiates the two is that, in most cases, you’ll have to get a blood test if you want term life insurance with Fabric. Ethos doesn’t require it. Also, Fabric offers 20-year term policies while Ethos gives you four different options. In general, we think that both sites are good for term life insurance because it’s so easy to get it and there isn’t much difference between the way A.M. Best rates the insurance policy providers. We’d say that Ethos has the edge with term policies because they offer four different time lengths and blood tests aren’t required in most cases. If you’re just looking for accidental death insurance (it literally covers accidental deaths), then Fabric is the way to go. We believe that Ethos is a good site for obtaining term life insurance. It saves you the time of having to sit down for an hour or so as a life insurance agent pitches you various insurance products you may or may not be ready to buy. We also like how Ethos doesn’t typically require an examination in order to get a term life insurance policy for $1 million or less. When I signed up for life insurance two years ago, the company I chose required a blood test for my policy and, had I chosen a policy of $500,000 or more, I would’ve needed an examination, too. As for negatives, we believe that using an online site like Ethos prevents you from having face-to-face interactions with insurance agents who can answer questions about your policy. If you value these types of interactions, Ethos’ may not be the best choice. We believe the person who is the best fit for Ethos is someone who doesn’t live in New York and is looking for term life insurance who wants an easy way to obtain that offers multiple policy lengths. Ethos is a bait and switch company. Awful. Final quote after "underwriting" was $100 more per month than website quote. Terrible customer service. I got a call from some idiot over a terrible VoIP line that cut off the call. I'd look elsewhere. Complete ripoff and waste of time. Write a Review for Ethos Life Insurance!